Found this article on Apartment Therapy today, which just may be one of the best sites ever, so you should probably mosey on over there at some point and spend some time looking around. I promise you, you won't regret it! This article spoke to that voice inside my head that's been bugging me mercilessly the last few days to just clean my bathroom already. Clothes on the floor, curling iron on counter, bracelets strewn about - it really is quite the spectacle. Minute one is dedicated to clearing off surfaces. Put away your straight iron, find a new home for your SPIN magazine, toss your makeup back in the drawer and grab that old towel off the sink. Dirty clothes should be off the floor and those bobby pins that never seem to have a home should find one. Minute two is all about surface cleaning. Drop in some toilet bowl cleaner and let it sit until the last few seconds and then wipe down the countertops, sink and toilet tank and seat. Give your shower a spray with either store bought or home made daily cleaner (or white vinegar). Run your toilet brush around your toilet and you're done. It's a busy minute but it can be done in that time frame. Your third minute is dedicated to straightening. Refold your towels and pull your shower curtain closed so it can air out. Check to make sure you have toilet paper and even take a few seconds to straighten the bottles on your countertops and those that live in your shower. You're on the downhill stretch and now it's time to check your mirrors. It's easier to get toothpaste spittle on them than you think and a quick wipe or spray with your favorite cleaner will keep them clean in a jiffy. If the mirror is already clean, take a moment to wipe down your sink and bath fixtures and make them shine. Did you panic at minute two when I said clean all the surfaces? Maybe you have kids that make things messier or you just don't move at lightning speed like I do. Take an extra 60 seconds to assess anything out of sorts and finish up. To make this system really work it has to be used EVERY DAY. 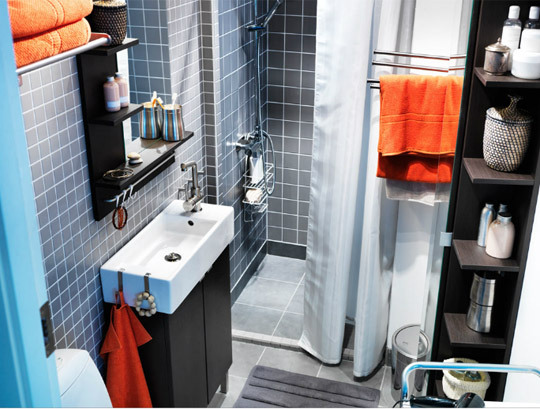 If you skip a few days here and there it's easy for your bathroom to get that layer of dust and grime that takes more than just a few minutes to remove. Once a week, skip cleaning your mirrors and fixtures and take a moment to sweep or mop the floor and wipe down the outside of your toilet. It can be done in a minute (ok, maybe two or three) if you mop with something easy like a Swiffer — if you can squeeze in the time to do it more frequently, great. Likewise, you can give your shower an actual scrub down — just use your time wisely and don't let it intimidate you! My heart is beating fast after reading that, the adrenaline is flowing - five minutes of pure excitement that is! So off to clean my bathroom I go. Aren't you inspired? Imagine if all of our bathrooms were sparkling simultaneously, it could be quite the day!